Martin O’Neill is thought to be interested in the Ireland job. However, the FAI has said it is in nor rush to make an appointment in the wake of Giovanni Trapattoni’s departure. Trapattoni’s reign as Republic of Ireland manager came to an end lat night when the two parties agreed an amicable split in the wake of yesterday morning’s 1-0 World Cup qualifier defeat in Austria which effectively ended their hopes of making it to Brazil next summer. 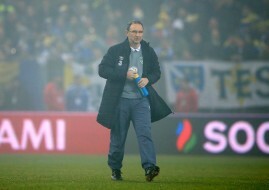 Martin O’Neill had already been installed as the bookmakers’ favourite to replace the 74-year-old Italian even before his departure had been announced as it became clear his days in charge were drawing to a close. “The Board will meet within the next week,” Delaney told Newstalk. “Today was a day to deal with Giovanni and [assistant manager] Marco [Tardelli] in a dignified manner, and hopefully people will respect the job he has done. O’Neill, who was sacked by Sunderland at the end of March, is not the only potential candidate to fill the vacancy, with ex-Ireland manager Mick McCarthy, currently at Ipswich, his former captain Roy Keane and current Norwich boss Chris Hughton also figuring prominently in the betting. “I think there will be plenty of interest because first of all, 24 teams go to the European Championships, it’s genuinely accepted we have a good crop of young players and the monetary incentive has been good over the last number of years,” said Delaney. 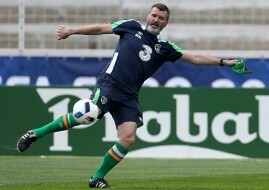 He added: “I think names like Mick, Brian McDermott, Chris Hughton, Roy Keane all come into the pot – Martin O’Neill, of course. “I wouldn’t want to comment on any individual chances. Mick has done a very good job for Ireland and in England as well. “We will look at the job description over the next week. The last four or five days have been difficult for everyone in Irish football. It was important to get a decision made in a dignified way.